After installation of Service Pack 3 for Microsoft Exchange 2010 some of you can expirience problem with remote connectivity to Microsoft Exchange. on every exchange web services and uncheck this option. 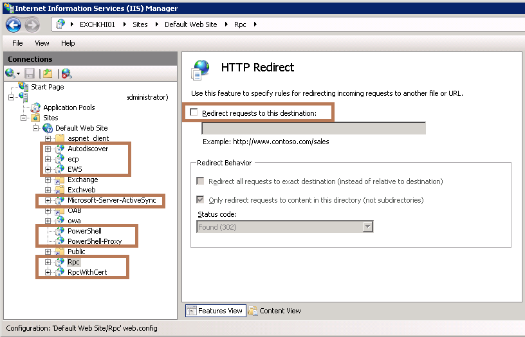 If you don’t have redirection applied you will not have this issue. Tagged HTTP 440 response was received from Unknown, Microsoft Exchange 2010 SP3, OWA. Bookmark the permalink. In the hopes of helping the next person, I was on Exchange SP2 Rollup 7 and I went to Exchange SP3 and Outlook Anywhere broke. The cause was not the above, not corrupt web.config files (the other common cause) – it was that SP2 was using ASP 2 and then SP3 uses ASP4 for HTTP activation (not required pre SP3)..